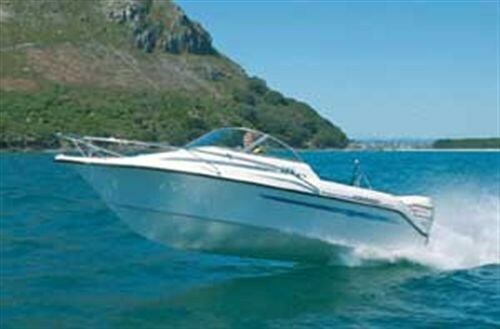 Challenger Boats of Tauranga could possibly be one of boating's best kept secrets. The new 525 Platinum III is possibly the best handling and quietest boat in its class. Steve Raea explains. 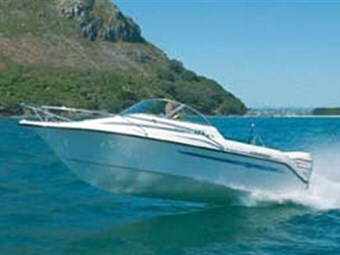 Tauranga's Challenger Boats is a relative newcomer to the fibreglass market, producing a range of cuddy cabin and hard top designs from 5.2m to 6.8m. The latest design, the Challenger 525 Generation III cuddy, is the replacement model for the Challenger 520 - the boat that put the company on the map. The Challenger 520 was the company's first boat and was released seven years ago as an entry-level introduction to the market. It found instant appeal among family-orientated buyers looking for a classy, well-finished boat suitable for general-purpose boating. As a market inducement, the boats were comparatively cheap compared to other more established brands and, as such, were not particularly highly spec'd. This did not concern buyers who were happy to add optional extras at their own expense during the fit out stage. What many buyers might not have realised, however, was that they had purchased a boat with a pedigree design from arguably New Zealand's most respected trailer boat designer Terry Reid. Reid's hull designs form the basis for some of the country's best performing brands, including AMF Boats and White Pointer. When Challenger Boats founder and builder, Alan McNearney, decided to enter the competitive GRP boat market, he went straight to Reid and laid his chequebook on the table. McNearney specified a strong hull capable of performing in typical East Coast conditions. And that is exactly what he got. Reid recalls designing the boat with a theoretical hull speed of 50 knots. This called for a very strong and rigid lay-up that was engineered by High Modulous in polyester resin, and resulted in a hull measuring 12mm in places. The 520 was born. Other cuddy cabin and hard top models followed, and today Challenger Boats is on target to produce 75 boats across six models. The company is in good health and there are plans in progress to release a 7m hardtop model next year. The new 525 is a different beast to its predecessor, with a new transom design and deck moulding, but the hull essentially measures the same overall - 5.5m. The Platinum badge relates to the spec of the boat, and the Generation III tag refers to refinements made over the hull's seven-year production span. The 525 hull has a moderate 18.5- degree transom deadrise and a fine long entry. The turn of the hull is well rounded and there are no flat surfaces to speak of. Challenger does not fit planing strakes to their hulls, claiming they are an unnecessary evil. The 525 has a single reverse chine turned down five degrees and measuring 80mm at the stern. Challenger construction is fairly typical with solid glass bearers and four full-length stringers glassed in each side of the keel line. The cockpit sole is hardwood ply resined both sides and glassed into the hull with a laminated hardwood ply transom glassed both sides. The 525 has a portofino stern with a moulded boarding platform each side of the outboard pod. The test boat was fitted with a new Bombardier-built Johnson 115hp outboard fitted by Tauranga Challenger dealer MasterTech Marine. The 115 outboard falls outside the 525's recommended horsepower range of 70 to 100hp ... and for good reason, too. The 525 coupled to the Johnson 115 could be a lethal combination in the wrong hands, but more on that later. Being a Platinum model, the new 525 carries a number of after-market options including upgraded upholstery, graphics and an electric capstan. 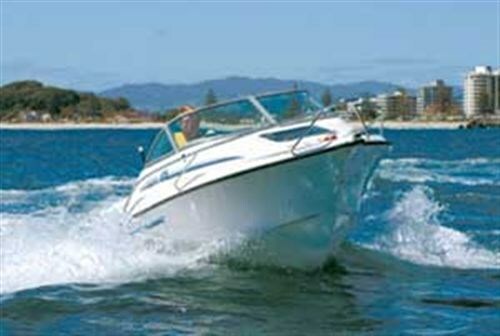 The 525 is first and foremost a family runabout designed to tow skiers and water toys, yet it provides enough cockpit space for inshore and coastal fishing. The cuddy cabin is placed well forward to maximise cockpit volume and is designed to provide shelter and dry storage rather than overnight accommodation. It is, however, well appointed with sumptuous squabs and upholstered parcel shelves that double as back rests. The cuddy has a pronounced step down and the bunk fronts are low to maximise sitting headroom. The area under the squabs is foam-filled for buoyancy and does not, as such, provide storage options. The cabin is fully lined and fitted with an overhead Weaver hatch within easy reach of the anchor locker and fairlead. While the first 525 out of the mould has a lined cabin interior, future boats will be built with a moulded one-piece headliner. McNearney says the benefits of a liner include easy cleaning and less construction time. The anchor locker is moulded into the foredeck to retain the boat's looks. It is fitted with a split lid that hinges back to port and starboard. The locker is deep and doubles as a crash bulkhead. While the test boat did not have a capstan fitted, this is an option and is designed to be mounted in a moulded recess in the foredeck. The boat is supplied with a stainless steel bollard and fairlead. The new 525 cockpit and helm station is modelled on the Challenger 618 and, while fairly basic in layout, it is nicely finished and fitted. The dash forms part of a large single moulding that makes up the entire cabin bulkhead. Access to the small cuddy cabin is excellent, with a full cutaway on the starboard side. The port side bulkhead does not fully enclose the cabin either. McNearney says future boats of this model will have a full driver's side bulkhead to seal the cabin. The 525 has a close-fitting wrap-around anodised aluminium windscreen that hugs the contours of the boat and looks smart and practical. There are various options for bimini tops and canopies. Seating arrangements vary according to owner requirements, with options that include king and queen seats on moulded bases, removable transom bench seat or single pedestals. The test boat was fitted with the standard king/queen combo on both sides. This is a good compromise, providing seating for four while maximising cockpit space for fishing. The seat bases provide ample storage for lifejackets, fenders and buckets. The cockpit has a single underfloor storage bin in the sole that is designed to accommodate up to four 25-litre tote tanks. The boat does not have an under-floor fuel tank. The batteries and oil pre-mix are set well off the sole and secured in the transom shelf. This area is sealed with two SoPac plastic hatches. There is further storage for tools in a sealed area within the transom moulding. The cockpit sole can be fitted with domed synthetic carpet for easy removal. Rod holders are positioned on the cockpit coamings with further storage in full-length side pockets. The optional stainless steel rocket launcher also provides the mounting base for the bimini top. 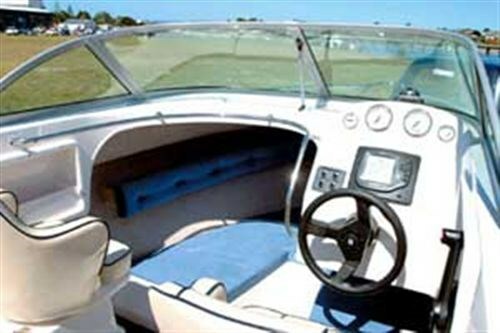 And while the bimini is optional, it is worth its weight in gold, particularly the front panel that domes down to the windscreen - a must for winter boating. The new 525 retains wide decks that makes it feasible to walk around the boat with the aid of the stainless bow rail. All up, the new 525 presents very well. It has a simple yet practical layout, and is finished to a very high standard. It has some nice touches usually reserved for larger, more expensive boats, and looks sharp with colour-matched graphics. Our outing was only the second in the new 525, and Mastertech Marine's Karl Rastrick was as eager as I was to put it through its paces. McNearney was on hand in a loaned Kingfisher 650 to see the boat run for the first time. Tauranga turned on the perfect day with clear blue skies, flat seas within the harbour, and a moderate swell beyond the Mount. My previous experience with the Challenger brand was in the 618 and it was impressive. The 525 was every bit its match. Never before have I experienced such a quiet riding boat. It is a big claim but thoroughly justified and is, I believe, the result of heavy hull construction and foam-filled buoyancy under the forward bunks. It must obviously also relate to hull design, which as mentioned, is from the board of a professional designer. As the photographs depict, there was plenty of lift in the swells and a lot of air to be had. Regardless, the landings were a delight. The bow sections are quite full and do a great job at dispersing wash as the bow cuts through the back of the swell. The boat is particularly buoyant and keeps her nose high, which again keeps spray to a minimum. The 115 Johnson is, if anything, too powerful for the boat but delivered an exhilarating ride, pushing the speedo round to 50mph in a flash. With two-up the horsepower presented no real problems, but my bet is the boat would almost definitely step out of line with a single or two lighter passengers. The boat loves to be trimmed well out on account of the reverse transom angle, even when charging off before a running sea. In flat water you can do as you please without fear or consequence. The boat goes around corners like it's on rails. It is a fun boat to drive and the performance of the 115 Johnson is simply exhilarating. I was impressed and reluctant to hand it over. While the absence of an underfloor tank might put some off, I would genuinely recommend that buyers in the 5m runabout market test this boat. It is solid, sure-footed and superbly quiet. The driving position is excellent, although the top of the windscreen is at eye height. Regardless, the new 525 is a winner.